Kristina McMorris has done it again. After her shining debut, LETTERS FROM HOME, she was under quite a lot of pressure to write a successful sophomore novel and she delivers with BRIDGE OF SCARLET LEAVES. Since its March publication, it continues to receive rave reviews and write-ups. Los Angeles, 1941: Maddie Kern is a violinist with dreams of Julliard. She falls in love with Lane Moritomo, the best friend of her brother TJ and the ambitious son of wealthy Japanese immigrants. Maddie and Lane expect their relationship to meet with disapproval, but when Pearl Harbor is bombed the day after they elope, Lane is no longer just an outsider...he’s now seen as the enemy. McMorris uses her unique perspective as the American daughter of a Caucasian mother and Japanese immigrant father to focus on a controversial, complicated time in American history sure to capture reader’s attentions. She heavily researches the period without her writing becoming academic. I would argue it remains a time not understood by many Americans, something we as a nation are ashamed of and would rather not talk about. Lane and his family are rounded up like common criminals and interned at a war relocation camp. Maddie follows, sacrificing her dreams of Julliard. She tries to gain acceptance from her new family while her own family turns their back on her and Lane tries to prove his allegiance to America. BRIDGE OF SCARLET LEAVES beautifully explores family duty, loyalty, pride, romance, suffering and loss. McMorris weaves the three points of view between Maddie, Lane and TJ sharing their family dynamics in a heart breaking, smart, faced-paced storyline to make the factual history work with the fiction. Reading Kristina McMorris' writing is nothing short of poetry. 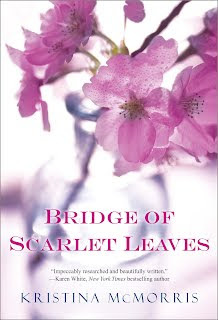 BRIDGE OF SCARLET LEAVES will have you laughing, taking pause and also reaching for Kleenex, as I did more than once. You can find Kristina McMorris on her website, as well as Facebook and Twitter.